My favorite new catalog from Hinkley Lighting has the best description I've ever seen on How to size an outdoor lantern. I'm sure you can't read the details, so let me spell them out for you: The height of an outdoor lantern should be based on the height of the door. For 1 lantern, it should measure 1/3 the height of the door. 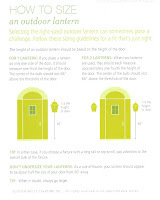 For 2 lanterns, they should each measure approximately 1/4 the height of the door. Either way, the center of the bulb should rest 66" above the threshold of the door. Their most important tip is "When in doubt, always go larger". This is SO true! In all my years, I have almost NEVER seen an outdoor fixture that is too large for a house, but I see them all the time where they're too small. So you have to have faith in that tip!